Kimball, South Dakota on this Day in 1995. It was on this day, May 29, 1995, that Tom Danneman and I chased a Dakota Southern freight on a former Milwaukee Road line across the rolling South Dakota prairie. Track conditions didn’t allow for train speeds greater than about 5 to 10 mph, so we were able to make several sets of images over a relatively short period of time. 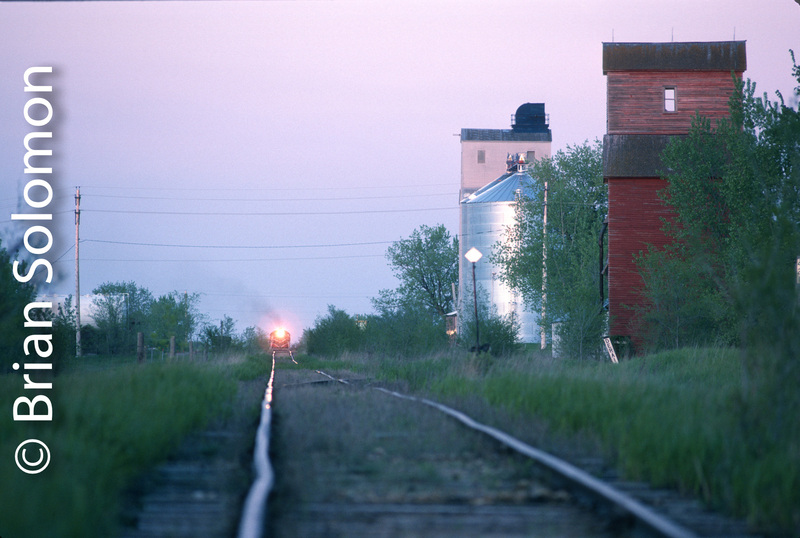 I made this view at dusk with a Nikon and 200mm lens while standing at grade crossing near Kimball. I like the way the electrical polls and wires frame the tracks and train. Previous PostPan Am Railway’s EDBF: Stone Arches and DASH8s.Next PostSix Vintage 201 photos: Spring with Irish Rail 213!